The WineHQ Wine development release 1.8-rc2 is now available. Bug fixes only, we are in code freeze. 25064 Solo on Keyboard 9.0.5: Clicking on HTML page no effect. 39665 dinput: MotoGP 3 demo fails to accept key presses to control the driver. 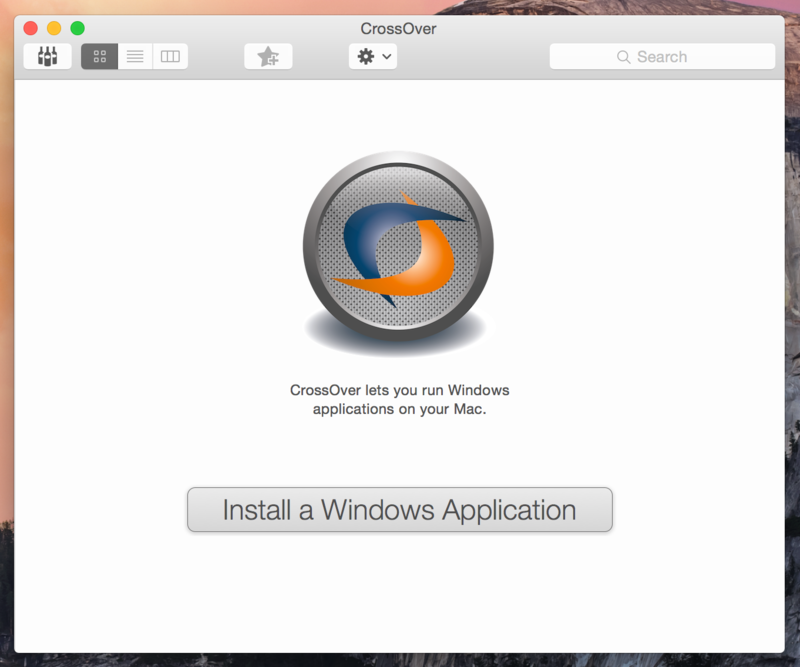 CrossOver 14.1.11 для Mac OS - Программа, позволяющая запускать многие приложения, написанные для ОС Microsoft Windows в Mac OS X, причём наличие при этом установленной Windows не требуется. CrossOver отличается от Wine более узкой направленностью: он нацелен на поддержку наиболее востребованных офисных и иных приложений Windows, таких как Microsoft Office разных версий, Microsoft Internet Explorer, Lotus Notes, Adobe Photoshop и другие. Но зато совместимость с этими приложениями тщательно тестируется и отлаживается, так что их работа обычно бывает стабильнее, чем в Wine. А если вы используете этот скидочный код ( UNITY ) вы можете сэкономить дополнительные 30% от $20.95 цене. Well it's that time of year again folks, Thanksgiving is in just a couple days and before the holiday has even began people are counting down the days until Christmas 2015. And one of the great things about the holidays is sales and more sales, sales on everything from gum drops to granny's bloomers. And in keeping in the yule tide festive holiday cheer, the folks at CodeWeavers will have a little sale on CrossOver Mac and Linux for all your Windows applications, programs and games need's on Mac or Linux. But why buy now? this is the perfect time to purchase for a couple good reasons. So how do you get this 30% discount? it's extremely easy just click this link and see your instant savings. You can share this page or the link on your site, social media accounts and let others know that there is a CrossOver Black Friday, Cyber Monday sale going on. WineHQ has released Wine 1.8-rc1, The Wine development release 1.8-rc1 is now available. This is the first release candidate for the upcoming Wine 1.8. Please give this release a good testing to help us make 1.8 as good as possible. 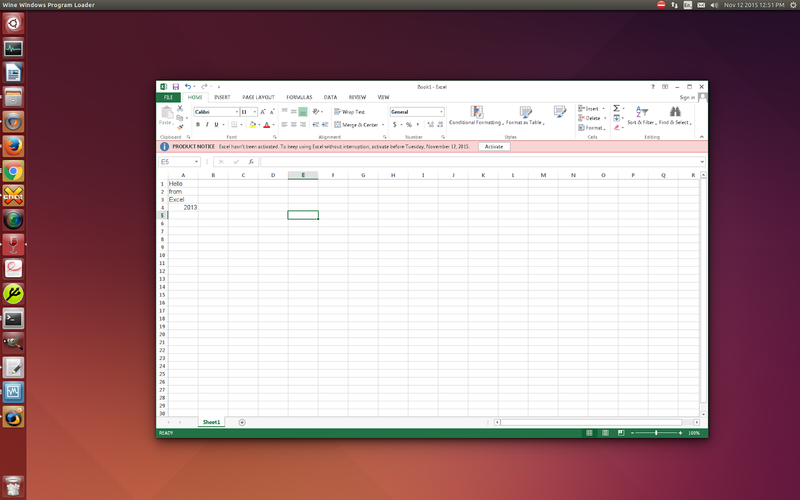 CodeWeavers, the company behind projects like CrossOver and Wine, has announced that it's making great progress with Microsoft Office 2013 and World of Tanks, among other things. Wine is a powerful tool, but developers need to constantly work on it, as Windows apps and environment are always changing and evolving. Something that runs today in Wine or CrossOver might now work tomorrow. Another difficult task is to make certain apps run in the first place, like Microsoft Office 2013, for instance. 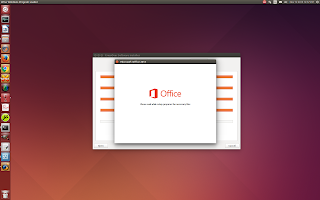 If you ever install Microsoft Office 2013 in Windows, you'll notice that it comes with a myriad of DLL and various other important dependencies, so you can always imagine what a difficult task it is to make it work in Linux. Another point of interest is World of Tanks, which happens to be one of the most played MMO titles right now. The fact that Linux users have a hard time playing it is not a good thing, and CodeWeavers knows this all too well. They are working right now to correct that problem, and they've already made some progress in this regard, especially for the latest World of Tanks 9.9 update, which seems to create some issues. The developers from CodeWeavers are planning to make some improvements in the upcoming CrossOver and Wine versions, and that includes all the fixes mentioned above. "With World of Tanks we began by triaging a crash that started with the 9.9 update. We fixed the issue quickly and sent a new build to Wargaming. We followed this with a fix for a severe drop in frame-rates with the 9.9 update. A fix for the frame rate issue and a mouse offset issue is on its way to Wargaming now. For CrossOver 14, we tested fixes with Microsoft Office 2010's behavior on dual screen systems. This includes full-screen maximize/minimize the behavior of primary and secondary screens on Gnome Classic and Gnome Shell with Metacity and Debian 7," wrote Caron Wills from CodeWeavers. 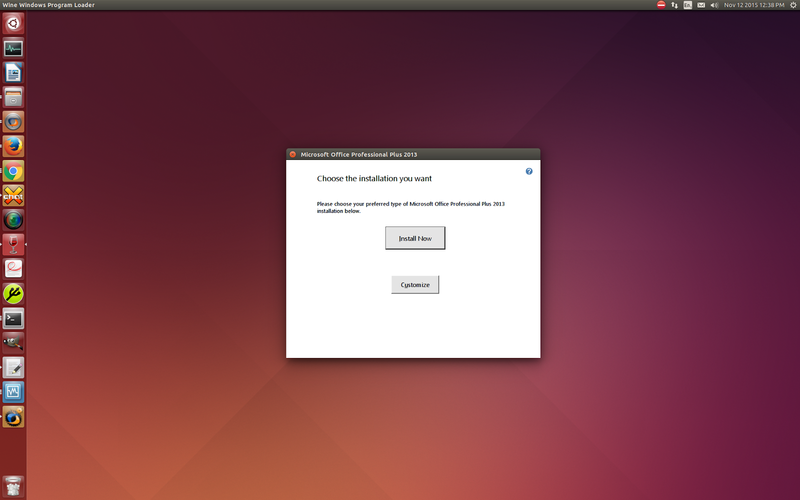 Follow my step by step guide on installing, configuring and optimizing Darkstone in Linux with PlayOnLinux . Note: This guide applies to the GOG version of Darkstone. Other versions may require additional steps. — Щелкаем по реплею и выбираем приложения для открытия WorldOfTanks — не забываем ставить галочку на использование данного приложения по умолчанию. Доступен очередной экспериментальный выпуск открытой реализации Win32 API - Wine 1.7.55. С момента выпуска версии 1.7.54 было закрыто 76 отчётов об ошибках. Закрыты отчёты об ошибках, связанные с работой игр и приложений: Adobe Premiere 6, Cubis Gold 2, ArcSoft PhotoStudio 5.5, PowerDVD 10, MyPhoneExplorer 1.8.4, BBC iPlayer, FarManager v3, Sacred 2 Gold, Picasa 3.9, Black Mirror 3, FreshDiagnose 8.67, Sades 7.1, Emerge Desktop 6.1.3. New mobile wineskin winery website and forums coming soon. I'm planning on revamping this website. The current plan is I'll make pretty much the entire website from scratch, as it's really all static data besides news updates, so it's not too difficult. The plan is to make it responsive so it'll look and work right on anything from phones to desktops. The issue comes down to... I don't want to try to make a Forum from scratch. I'd like to find one I can integrate in easy and will work good, including a responsive design. I'd like input if anyone has anything I should look at that would be easy enough to use and would work good for the website here. Allows users to also make accounts, so trusted users don't have to go through moderation. Anything else anyone can think of? I haven't messed with Forum software much in years, but anything has to be better than this one... going to dump all of Tiki software. 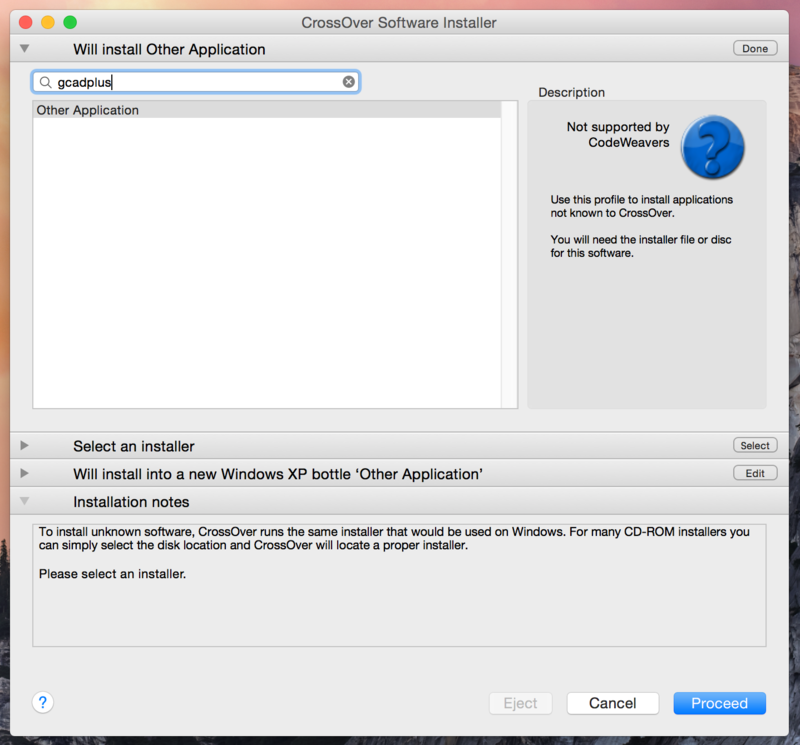 About : Wineskin is a tool used to make ports of Windows software to Mac OS X. The ports are in the form of normal Mac application bundle wrappers. It works like a wrapper around the Windows software, and you can share just the wrappers if you choose. Wineskin 2.6.2 Minor update is available as an update in Wineskin Winery. This should fix Winetricks to be able to update correctly in El Capitan. This update is available as an update in Wineskin Winery. The Wine development release 1.7.55 is now available. Various fixes for Microsoft Office 2013 support. Some more implementation of the Web Services DLL. More fixes for the latest C runtime version. Improvements to the Makefile generation. Now that release 1.7.55 is out, it's time to start code freeze towards the stable 1.8 release. This means that from now on, new features or code redesigns won't be accepted; only targeted bug fixes that don't look too dangerous will be allowed in. The freeze will get increasingly more strict as we progress towards release. I know that git makes it easy for everybody to keep working on new things on their own branch, but I'd ask that we all take time to concentrate on fixing bugs, and particularly regressions. I'm hoping that we can make the number of regressions drop significantly, like we did for the previous stable releases. I will be making release candidates every Friday until we run out of bugs that can be reasonably fixed. Based on previous experience, the code freeze should last between 4 and 8 weeks. 35953 FFXIV: ARR - Launcher requires native winhttp to run. 38390 Photoshop 64-bit (CS/CC) crashes when you break the rendering preview. 39551 building dlls/atl fails: error: Could not open importlib stdole2.tlb. 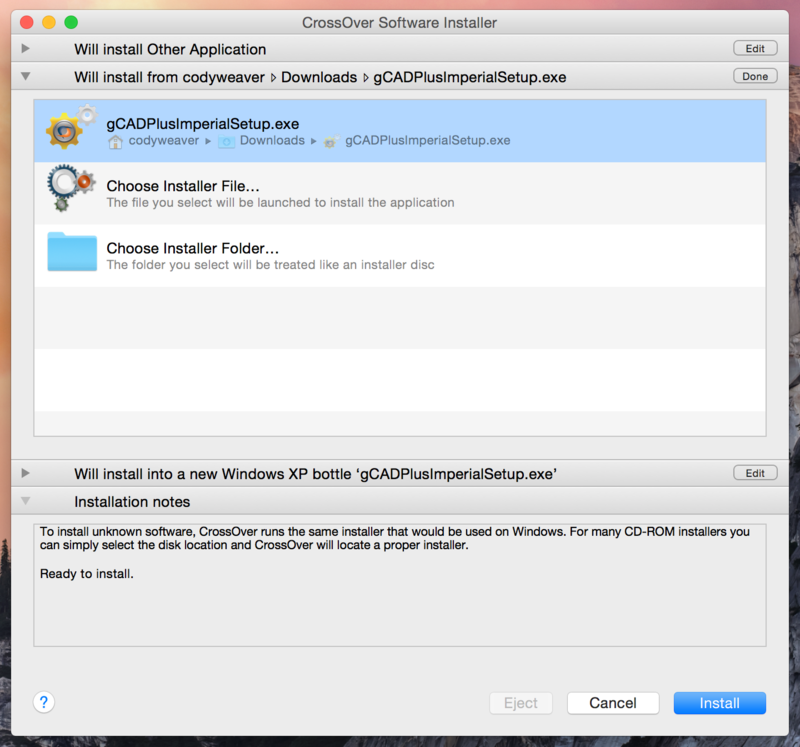 We are asked about Windows software running in CrossOver all the time. The range of programs varies so much that it's always questionable on what it might take to get the application running. Most of the time, it's easy. 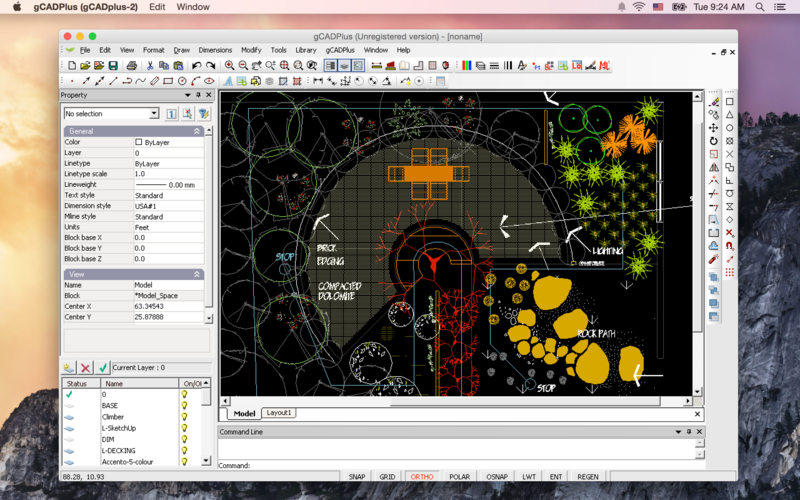 Recently, we received a request for a second look at GardenCAD and it's big brother, gCADPlus. To our surprise, the team for gCADPlus checked us out a few years ago and put together a handy walk-through for our product. 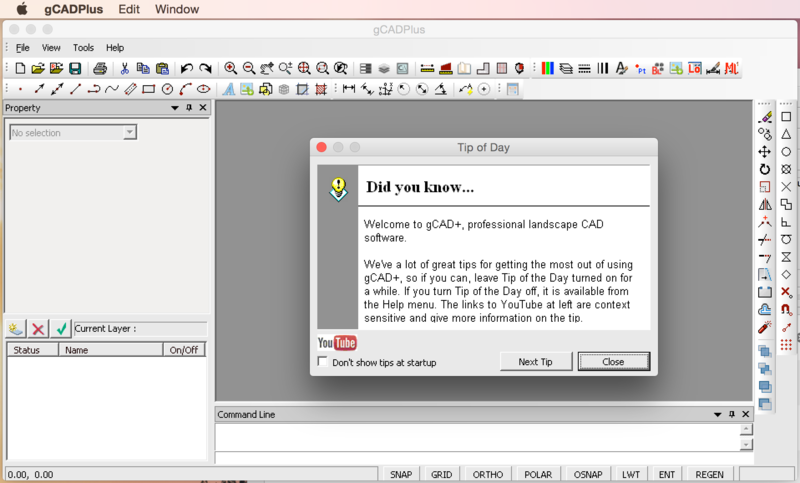 What they didn't know, we've made it easier than ever to install an unsupported program, like GardenCAD. 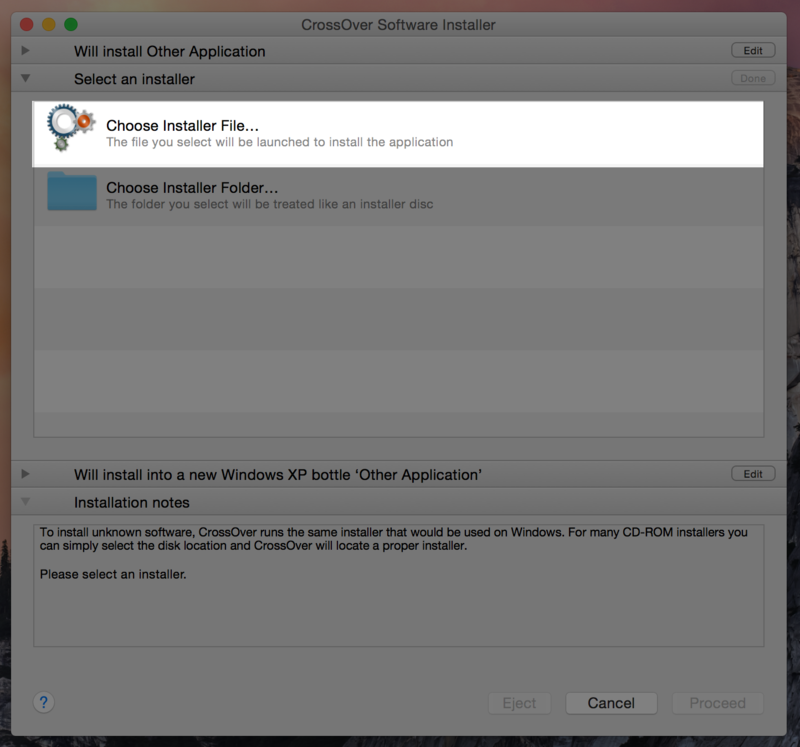 To be clear, an unsupported program is a Windows program that has not been regularly tested by a member of the CodeWeavers team. Before we get too far, let's talk about what it takes to install an unsupported program. When your application doesn't show up, it's some "Other Application" that CrossOver doesn't know about... and that's okay. More applications than ever run in CrossOver. 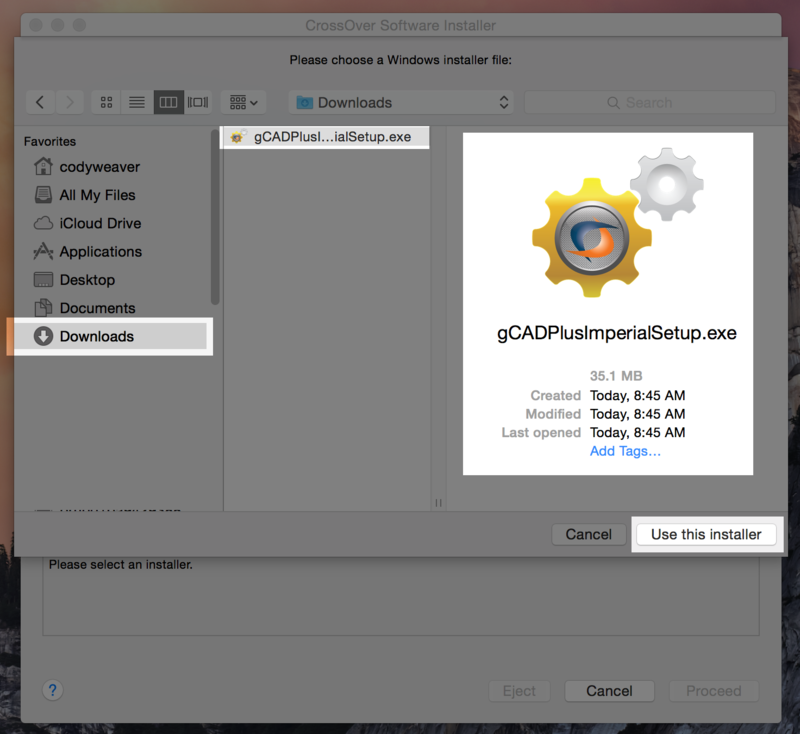 For gCADplus, the installer starts, completes and gCADplus launches! Microsoft Office 2013 (code named Office 15) is a version of Microsoft Office, a productivity suite for Microsoft Windows. It is the successor to Microsoft Office 2010 and the predecessor to Microsoft Office 2016. It includes extended file format support, user interface updates and support for touch among its new features. Office 2013 is suitable for IA-32 and x64 systems and requires Windows 7, Windows Server 2008 R2 or a later version of either. 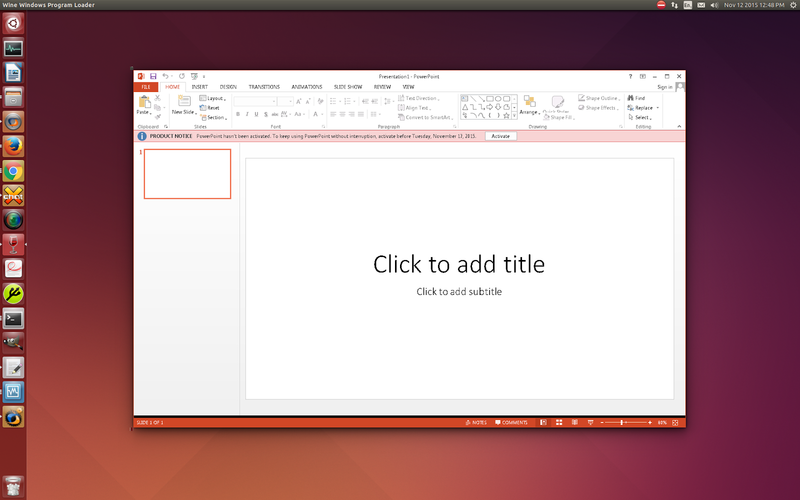 A version of Office 2013 comes included on Windows RT devices. Mainstream support ends on April 10, 2018. Extended support ends on April 11, 2023. Development on this version of Microsoft Office was started in 2010 and ended on October 11, 2012, when Microsoft Office 2013 was released to manufacturing. 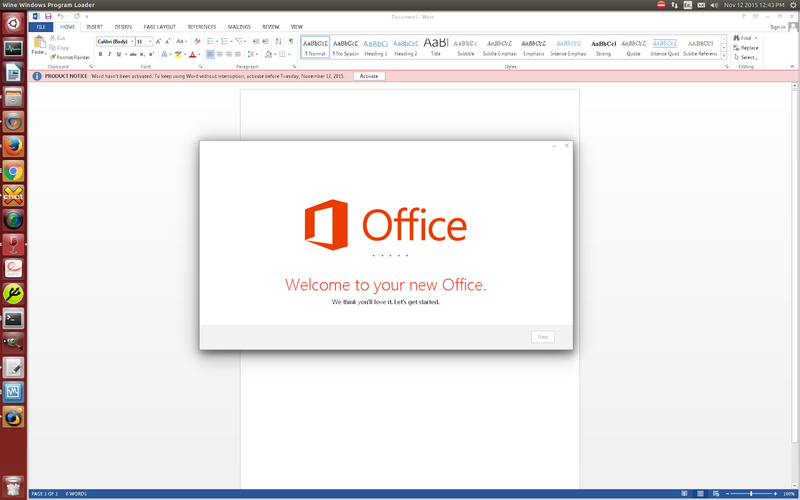 Microsoft released Office 2013 to general availability on January 29, 2013. 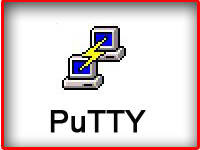 This version includes new features such as integration support for online services (including OneDrive, Outlook.com, Skype, Yammer and Flickr), improved format support for Office Open XML (OOXML), OpenDocument (ODF) and Portable Document Format (PDF) and support for multi-touch interfaces. 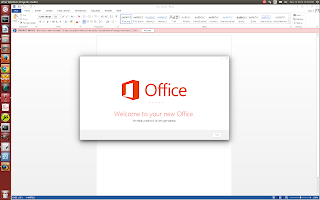 Microsoft Office 2013 comes in twelve different editions, including three editions for retail outlets, two editions for volume licensing channel, five subscription-based editions available through Microsoft Office 365 program, the web application edition known as Office Web Apps and the Office RT edition made for tablets and mobile devices. Office Web Apps are available free of charge on the web although enterprises may obtain on-premises installations for a price. Microsoft Office applications may be obtained individually; this includes Microsoft Visio, Microsoft Project and Microsoft SharePoint Designer which are not included in any of the twelve editions. 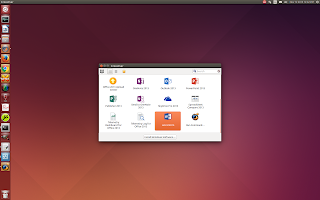 In the upcoming release of CodeWeavers CrossOver Linux 15 we will see many new and exciting changes over the current CrossOver 14 edition that's available now. Don't get me wrong CrossOver 14 is a nice release and runs many productivity applications and games that we care about today. CrossOver Linux 15 is a whole new ball game, it will come with Microsoft Office 2013 functionality, the beginnings of DirectX 10 and 11 support, a newly refreshed and modern Graphical User Interface (GUI) and incorporate just over a full years worth of Wine from WineHQ changes into the release. And most likely will ship with the upcoming Wine 1.8 stable release or a variant of that release. Not only will we get a newly updated Graphical User Interface (GUI) we will also get a totally new version of Wine with many DirectX 10 and 11 enhancements. So the day of playing DirectX 10 and 11 games on Linux is soon approaching. I can only imagine the effects on work productivity as we will be like children in a candy store once again. So on to the main article, this isn't a how-to or user guide but simply a news post. CrossOver 15 is still under extremely heavy development and testing. This news post is to inform everyone of a small sample of whats soon coming our way. You can go to MSDN and download Microsoft Office Professional Plus and get a free 60 day trial here. 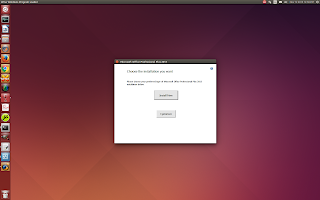 After you have registered and got the download it's time to run the install with CrossOver Linux 15 on your Linux Computer. Keep in mind this will install and run on any of the popular modern Linux distributions, Ubuntu is in no way a requirement. 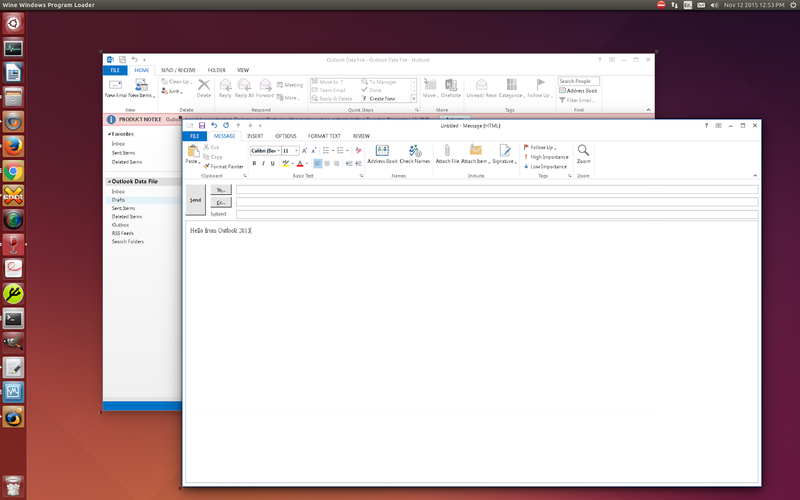 Now the real fun begins, time to run Microsoft word 2013 for the first time on Linux. 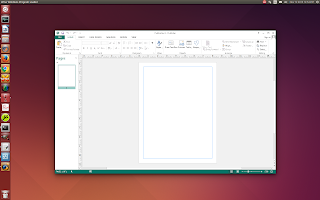 Microsoft Word 2013 is now running on Linux, Thank You CodeWeavers! PowerPoint 2013 running on Linux with CrossOver Linux. 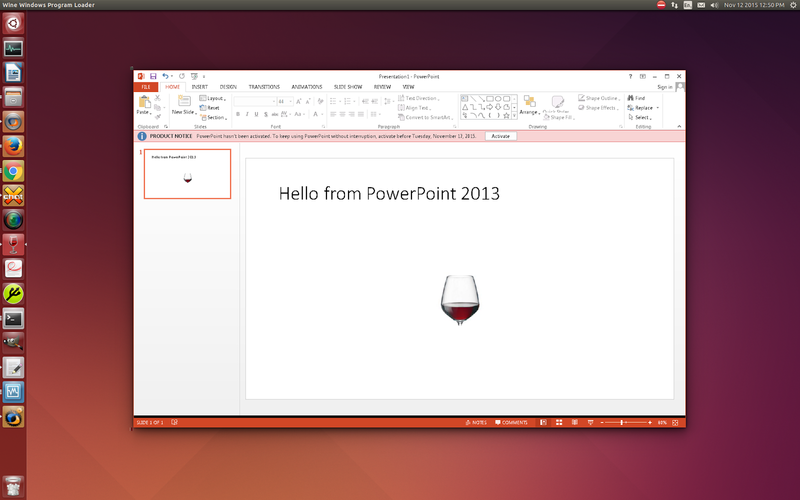 Hello from PowerPoint 2013 on Linux with CrossOver Linux. 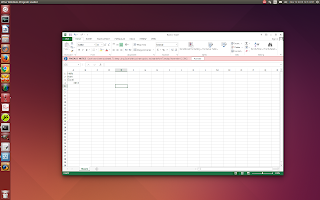 Microsoft Excel 2013 on Linux with CrossOver Linux. Microsoft Outlook 2013 on Linux with CrossOver Linux. Microsoft Publisher 2013 on Linux with CrossOver Linux. Wow, was that fun or what? and this is just a small sample of what's to come in the upcoming CrossOver Linux 15 release. If you want to help support future Wine development and CodeWeavers just go over to CodeWeavers online store and pick up your copy of CrossOver for Mac or Linux. When you use promo code ( UNITY ) you will receive a instant 30% discount and help support future development. I know you want to play some DirectX 10 and 11 games on your Linux or Mac computer. The WineHQ Wine development release 1.7.54 is now available. Implementation of the TransmitFile function. More implementation of the Web Services DLL. Alternative for the deprecated prelink tool. 32620 Warcraft Voice Chat cannot capture voice. 39171 Creatures: White pixels are black. I just setup a voat subverse for CodeWeavers if you want to come join the conversation and see how a proper Reddit should be managed VOAT is the place to be. 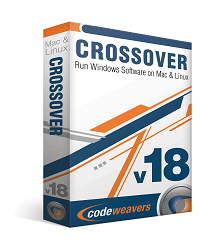 CodeWeavers sells a proprietary version of Wine called CrossOver for running Windows applications and games on Mac OS X, Linux and Android. 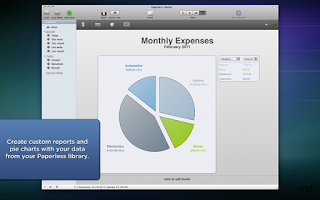 Mariner Software Mariner Write is your Mac OS go-to word processing tool! Professional writer, educator or student, Write has all the functionality you need for that important letter, technical paper or research project. Elegantly efficient and powerful, Mariner Write turns out great looking documents. 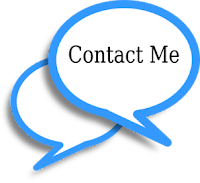 Create customized headers, footers, endnotes or footnotes. Easily define styles; use keyboard shortcuts for repeated tasks. Use Mail Merge to automate a mailing. Write possesses a powerful Find Dialog, an intuitive Font Panel and much more. Mariner Write empowers you to create your own word processing environment so you can produce documents that are clean, consistent and professional. Fixed an issue with the Print dialog when running El Capitan. You can use any of these 4 coupons in Mariners online store and save between 5% and 25% off the retail price of new purchases or one of the 5 pack bundles. Mariner Software MacGourmet Deluxe is a recipe-management application that allows users to create, edit, and scale new recipes, or import recipes from their favorite websites, then share them via email, Facebook, and Twitter. Unlike MacGourmet, MacGourmet Deluxe users can also plan meals, analyze nutritional information, and generate shopping lists. Version 4.2.2: Note: Now requires a 64-bit Intel processor. Updated the web site importer to support additional sites. Updated the AllRecipes.com importer to support the new site format. Updated the Food&Wine.com importer to parse the instructions properly (format change). Added a print template to print Nutrition info. Updated the print preview display to properly update style and template changes (MacOS change). Fixed a bug with calculating nutritional data that caused an exception (crash). Fixed MealPlan printing to read the css styles. Added missing Retina display images and icons. Mariner Software MacGourmet is a recipe management application that allows users to create, edit, and scale new recipes or import recipes from their favorite websites, then share them via email, Facebook, and Twitter. For more core functions, try MacGourmet Deluxe. However, there are a few things I'd like to get in first (*cough* Pulse driver), so my thinking is to do one more development release cycle, and start code freeze after 1.7.55. This should enable us to release 1.8 before the end of the year.